This edited article about guns first appeared in Look and Learn issue number 536 published on 22 April 1972. There are some weird and wonderful weapons in the Artillery Museum at Woolwich outside London, and one of the strangest is the “Leather Gun.” The barrel is a copper tube bound with rope and covered in leather. It may have belonged to King Gustavus Adolphus of Sweden who made good use of these strange “leather-guns” during the Thirty Years’ War, though other countries used them as well. No one is certain who invented leather-guns. A good claim could have been made by a Scotsman named Robert Scott. He died in 1631 and there is a monument to him in London’s Lambeth Church. It says that the inventor “. . . bent himself to travel and studie much and amongst other things invented the leather ordinance and carried to the Kinge of Sweden 200 men . . .” Unfortunately for Scott, an Austrian gun-maker also arrived at the Swedish court and got the credit for Gustavus Adolphus’s revolutionary artillery. Scott had a nephew named Weems and he cashed in on leather gun-making during the English Civil War. Colonel Weems seems to have earned quite a fortune from his leather-guns and by 1643 he had become Lt. General of Ordinance and Train. Weems’s cannon could be drawn by one horse and this lightness, plus their cheapness, made them very popular. On the other hand they wore out quickly and sometimes got so hot during a battle that they went off of their own accord! The Parliamentarians’ light artillery also had another advantage over heavy iron guns; they did not need so many animals to pull them. Even that dashing Royalist, Prince Rupert, had to throw some of his best cannon into the Thames to stop them getting captured. He just didn’t have enough horses to tow them away. When the brilliant Duke of Marlborough came on the scene some decades later the British Army’s artillery was still in a sorry state. Marlborough was a great general and fully understood the importance of gunnery. The whole organization of trains of artillery was brought up to date and new ideas adopted. Uniforms were standardized, as was equipment. Some trains even included portable boats as well as guns, ammunition waggons and blacksmith’s forges on carts. Yet even in Marlborough’s “modern army” half the men in every train were civilian drivers hired with their horses to pull the guns. The poor discipline of these civilian drivers may have been one reason for the creation of the Royal Regiment of Fusiliers. The Fusiliers guarded the artillery trains, but they also had to keep an eye on the panicky drivers if the battle started to get dangerous. This edited article about Ancient Greece first appeared in Look and Learn issue number 536 published on 22 April 1972. 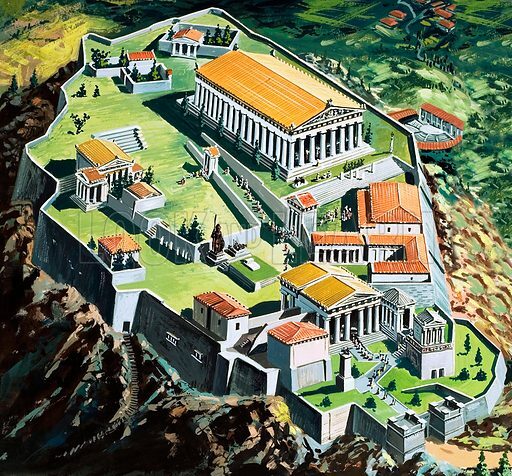 Men have lived on the hill which soars above modern Athens for nearly five thousand years. Pieces of the walls they built in the Bronze Age are still standing. They were lured by its dominating position, and precious natural springs, life-giving water in a land often barren and parched. On that great rock, at a time when the Egyptians were building temples to the god Osiris, and the Jews raising their voices in hymns to “the one true God of Righteousness,” lived a race of people who worshipped a whole hierarchy of Gods, from Zeus, the king of them all, to Cerberus, the three-headed dog who kept the gates of Hell. Superstitious though they sound, they were about to take a step into the future which would influence the whole way of life of everyone in the western world. To the Romans, we owe our knowledge of civil engineering; to the Jews our idea of one God. For almost everything else, we are indebted to the Greeks. All our science, literature and art began with them. Greece at that time was a country of scattered independent villages, and little primitive townships which often perched on a hill-top site called an acropolis. The peaceful peasants loved their fields, and countryside, and composed songs and dances to celebrate the seasons. Out of their pastoral festivals grew the great Greek dramas we know today. Out of their love of making beautiful things grew the simple, elegant architecture which is one of the world’s marvels. Peaceful though they were, they seem to have been constantly at war, and from about 800 B.C. they began to draw closer together for mutual protection. Many people moved from the scattered villages to the shelter of the hill-top townships, which squatted there like mother-hens. Other villages, for increased strength, merged their governments. In some places a mixture of the two took place. This happened in a district called Attica, a great plain with hills to the north, and to the south the Gulf of Aegina, part of the Mediterranean Sea. With its dominating acropolis, the natural watchdog of this area was Athens – named for Athene, goddess of wisdom, science and art – six miles inland from the sea. This edited article about exploration first appeared in Look and Learn issue number 536 published on 22 April 1972. June 26th, 1785. Despite the warmth of the day outside there were innumerable fires blazing in the hearths of the great palace of Versailles and in the anteroom to the King’s study it had become intolerably hot. Jean de La Perouse suddenly realised that he was making matters worse by pacing nervously up and down and with a rueful grin he sat in the large window seat and tried to contain his excitement and impatience. He was 44 years old and had already acquired an enviable reputation as a seaman of distinction. The British, more than most, knew and feared him as a Captain to be avoided when the two countries were at war. But despite the excitement of a very active career Jean knew he was on the threshold of something much more important. He had been chosen to command a French expedition to the Pacific Ocean and so important was it that the King himself had decided to issue him with his instructions. It was to be a voyage which would rival that of Captain Cook and a great sweep of the Pacific to be made by La Perouse could hardly be bettered. New lands, new discoveries; death in huge breakers and at the hand of warlike savages; all these lay ahead. And at the end a mystery so complete that it took 40 years to solve it. 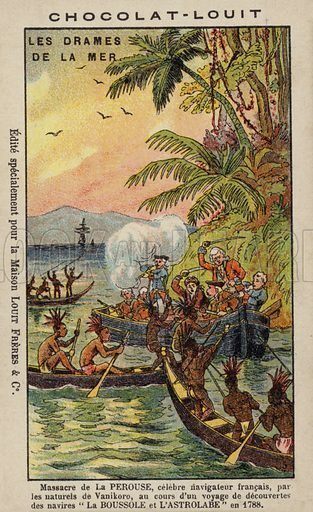 King Louis XVI had done more than take an interest in the expedition. His instructions were hand-written and so detailed that they covered 36 pages. But La Perouse had four main tasks. First, he was to look in the southern ocean for land sighted by Bouvet but which Cook had failed to find. Second, to explore the Pacific islands lying towards Australia and New Guinea. Third, to chart some of the coastline of Australia and last to explore along the mysterious Far Eastern coasts of China, Manchuria and Japan. He was to go as far north as possible and – inevitably – try and seek the fabled North-West passage. It was a well-nigh impossible task but La Perouse was to complete an astonishingly large part of it. In the meantime, he worked quickly. Two ships were chosen and an old friend, Paul de Langle agreed to command the second one. By July 12th they were ready, but contrary westerly winds kept them in port until August 1st. Then, with a salute from the fort at Brest and a large crowd to wave them off, La Perouse and his expedition were away at last. A stiffening breeze soon had them out of sight and on the first, long leg of the journey. This edited article about Pauline Bonaparte first appeared in Look and Learn issue number 536 published on 22 April 1972. In a museum in Rome there is a statue of a woman reclining on a sofa. Propped on her elbow, she is modelled in the classic style. She holds an apple in her left hand and in her eyes there is a distant look; in her half-smile a hint of pleasure enjoyed, savoured and remembered beyond the grave. 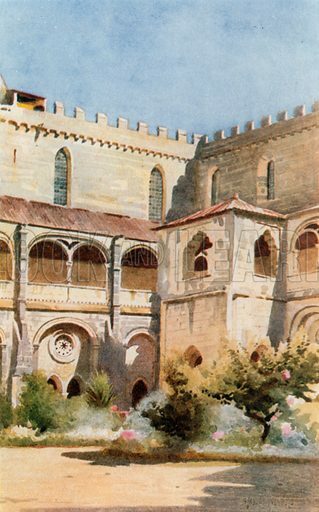 The answer was typical of the girl who rose from the rags of Corsica to the riches of France, of whom it was said that no-one was ever bored by her company and who unwittingly projected her soldier brother on to the first step of the ladder he took to international fame. When France lay in the grip of the Revolutionary Reign of Terror and Napoleon Bonaparte was a young and unknown lieutenant in the French army, Pauline Bonaparte was living in a tumbledown house in the old quarter of Marseilles, so poor that her clothes were all faded and shabby and earning a few sous by taking in the local washing. To this house one day came Citizen Freron, Commissioner of the Convention to Marseilles, a man who, at 28, had the kind of power that only a terrorist government can delegate. A word from this Citizen was enough to send a man to the guillotine – or to an important government appointment. If Freron was a man to be feared, Pauline Bonaparte was a girl too scatter-brained to know the meaning of fear. She was soon passionately attracted by Freron and set her heart upon marrying this influential man. Freron, too, was in love with her, and showed his interest by using his power on behalf of the Bonaparte family. When Pauline’s soldier brother Napoleon complained that his services to the army went unrewarded, Freron recommended him to Paris for promotion to an important command. Napoleon did not know this at the time and eagerly took every chance that came his way. And for Madame Bonaparte there was a small pension, which made it possible to send out the laundry and buy a few luxuries. But Pauline’s dream of marriage was not to be. In Paris Napoleon had risen faster than anyone thought possible. He had married Josephine and was already a real power in the land; looking down from this high office he decided that Citizen Freron was not a worthy suitor for his sister who should marry riches as well as power. His choice for Pauline was General Leclerc, the well-educated son of a rich ruler, and believed to be a “coming man” in the new France. Pauline offered no objection, for she loved a pretty uniform and Leclerc was fair-haired and quite good-looking. This edited article about Pedro of Portugal first appeared in Look and Learn issue number 536 published on 22 April 1972. All history’s kings have been entitled to their own peculiarities. It has always been one of the advantages of being a king that your eccentricities are above reproach. And of all the world’s kings who have left their catalogue of eccentricities to posterity, few can better the 14th century King Pedro of Portugal. Pedro’s story is entwined with a woman who became a legend in her country. She was Inez de Castro, and Pedro’s love of her deserves to rank with the love of Hero for Leander, Paris for Helen, and the other immortals. Inez, a gay, laughing little girl of great charm, was raised with the daughter of a friend of her father, a girl called Constancia. Constancia’s father was a rich Spanish duke and the two girls played happily together, racing through the echoing corridors of the duke’s palace, inventing endless games and telling each other what they would do when they were grown up and free of the splendid but confining atmosphere of the court. Even as they chatted, however, Constancia’s future was already being settled for her by her father and his politically powerful friends. It happened that Alfonso, the King of Portugal, was looking for a Spanish wife for his son and heir Pedro, and there were many good reasons in Spain and Portugal why Constancia should marry the young man who would one day make her a queen. Alfonso quickly agreed the terms; that Constancia should marry Pedro in return for which he would send his Portuguese army to help the Spaniards drive the invading Moors from their country. 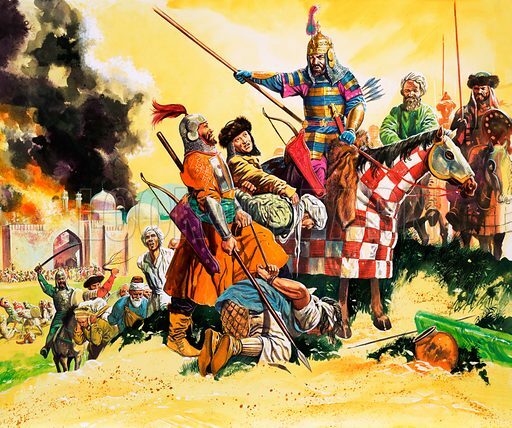 On 30th October, 1304, at the great and decisive Battle of Salado, his soldiers fulfilled his part of the bargain and the following year Constancia was married to Pedro. With the child bride on her journey to Lisbon went her lifelong friend, little Inez de Castro, who was to be her principal lady-in-waiting. But poor Constancia! Lisbon terrified her, and she shrank in alarm from her bridegroom whom his people called Collo de Garza, saying his neck was as long as that of a heron. Within months Pedro realised that his political marriage was doomed and, hurt by his wife’s dislike of him, he turned for companionship to her beautiful young lady-in-waiting, Inez de Castro. Soon the two were hopelessly in love. This edited article about Tamerlane first appeared in Look and Learn issue number 535 published on 15 April 1972. A band of 60 outlaws spurred their horses through the desert. In pursuit of them galloped a force more than ten times their number – a thousand riders, bent on blood. The leader of the fugitives coolly chose his moment to turn and fight. In the desperate skirmish that followed, the outlaw band was reduced to 10. But the enemy was routed. The leader of the outlaws was an extraordinary figure. He towered above his companions. And though he was only quite a young man, he had snowy white hair – as indeed he had done from childhood. This remarkable man’s name was Timur, which in his language meant “iron.” During one of the many battles he fought, he was wounded in the foot by an arrow, and after this he was nicknamed “I leng,” meaning “the lame.” Timur I Leng, or Timur The Lame, is the historical character popularly known as Tamerlane. Timur was an Asiatic. He was born in 1336, in a small town not far from the city of Samarkand, which was one day to become the capital of the great empire he won by force of arms. As a young man, Timur was of a serious, studious turn of mind. He was a great reader, especially of religious books. He loved playing chess. But he aspired above all to become a great warrior. His ambition was unbounded. It was nothing less than to become king of the whole world. At that time, central Asia was in a state of great unrest. Everywhere princes and chieftains were warring against each other. Timur took advantage of this to carve out a fantastic career of conquest. After many hair’s-breadth adventures, he found himself king of a territory roughly the size of France. But that was not nearly enough for Timur. He was still only 34 years old. He continued to wage relentless war against his neighbours. He was as ruthless as he was brave, and his name became feared far and wide. Whether Timur smiled or frowned could mean life or death. It took a very clever man to win his favour. During one of his victorious campaigns, a conquered prince came to kiss his footstool. The prince offered tributary gifts of silks, horses, jewels and slaves. In accordance with custom, each of these gifts comprised nine items – except that there were only eight slaves. The prince hastened to explain. He said, “I myself am the ninth.” This was one of the rare occasions when Timur smiled on a defeated enemy. This edited article about smugglers first appeared in Look and Learn issue number 535 published on 15 April 1972. The moon rode high above the clouds for a moment and disclosed the team of laden pack-horses as it wound along the track to Romney Marsh. Ten . . . fifteen . . . twenty men and fifteen horses with two barrels to each beast. Carter snapped his spy-glass shut and whispered orders to the sergeant beside him, who vanished silently into the trees. He looked at his watch. Another hour and then . . . . It was 12th December, 1688, and William Carter, newly-appointed exciseman, was about to round-up a gang of smugglers. But these smugglers were not bringing in spirits and tobacco to avoid duty. They were exporters, not importers. Their contraband cargo was fine English wool. As far back as the 13th century, the Government had tried to restrict the export of wool from England. By the 17th century, at least thirty Acts of Parliament had revived the prohibition. Usually the embargo was temporary, designed to protect England’s own woollen and worsted industries when they were threatened by those of the Low Countries and France. But wool-growers resented the restriction. They wanted to sell their fleeces where they would fetch the best prices; and in the 17th century. French merchants were prepared to pay as much as half-a-crown a pound for raw wool and six shillings for combed wool. There was a simple answer – it must be smuggled out. So from the same inlets and creeks along the coasts of Sussex and Kent by which brandy, lace and silks entered the country, wool left it. The smugglers, or owlers, pressed it tight into barrels which were washed with brine-water. At a casual inspection they could pass for barrels of salt beef or herring. William Carter was new to the job. The December undertaking was his first big operation and he had expended a lot of money and man-power on it, bringing in soldiers from the garrisons nearby. If he was successful it would rebound to his credit. If he failed, he would be a laughing-stock in the neighbourhood and his masters would not be pleased. Carter rode to the edge of the marsh. The sergeant was waiting for him at a prearranged spot. As he made a last-minute check of his dispositions, Carter had a momentary feeling of doubt; but the comforting pressure against his chest of the warrant for the owlers’ arrest quickly overcame it. This edited article about Edward II and Isabella first appeared in Look and Learn issue number 535 published on 15 April 1972. Some kings have left their mark so heavily on history that to the casual reader all the men around them in their age were puppets, eclipsed by the greatness of their monarch. Other kings who were weak have thrown into sharper relief the men around them, and the reigns of a few of these weak rulers who married strong-willed women, are remembered not for themselves but for their queens. Such a reign was that of King Edward the Second of England. If ever there was a monarch more blessed with misfortune it was he; if ever there was a royal marriage that was wrong from the start, it was his. 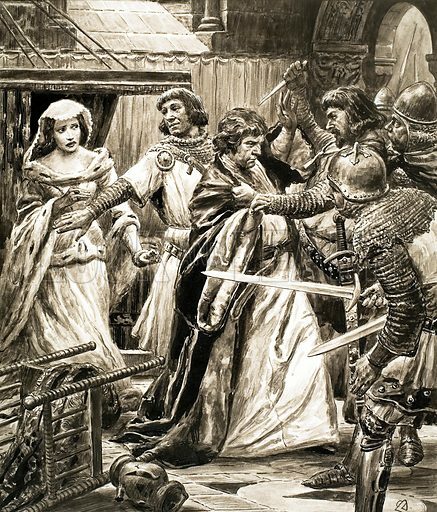 And if ever a woman made an unforgettable impact on her times, it was poor Edward’s strong-minded Queen Isabella. She was 26, the mother of Edward’s four children, and seething with discontent at the years of injustice her husband had done to her when the event happened that caused one of England’s most lurid royal scandals. At the time Isabella was living in the Tower of London – that fortress which then served as a home for royalty and a dungeon for royalty’s prisoners. One such prisoner was Roger de Mortimer, eighth Baron of Wigmore, serving a life sentence for rebellion. Among the many unscrupulous rascals who lived in the 14th century, Mortimer held high place; although he was still young he had crowded enough cruelty and ambition into his life to satisfy 100 mediaeval men to whom cruelty was second nature. Did they meet, this disaffected Queen and her husband’s wretched prisoner, in the Tower? No one can be sure. But it seems probable that as Mortimer was moved about within those walls for questioning, his dark eyes, sunk in a handsome face made pallid by confinement, met those of the lovely Isabella, called by many men the most beautiful princess in Europe. What happened next makes that probability seem a certainty. On the night of August 1st, 1323, while his guards slept in a drugged stupor, Mortimer crawled from his cell through a hole which had been previously dug, escaped to the Thames and a waiting boat, rowed across to the other side where horses waited, and got clean away to France. This otherwise impossible feat could have been achieved only by inside help, and help from a very high person. 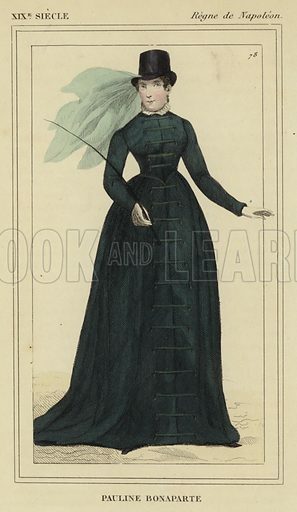 The following year Isabella persuaded her husband that she should go to France to act as a peacemaker between him and the French King Charles, her brother. Edward, tired of her continual hostility to himself and his friends, must have gladly let her go. Gladly, too, must Isabella have gone, for she was French; the court was in Paris and so, too, was Mortimer. Within weeks of her arrival, the scandal was public knowledge in England as well as France. This edited article about guns first appeared in Look and Learn issue number 535 published on 15 April 1972. The distant jangling of a silvered bridle sounding dully through the mist was the only warning they got. “Horsemen!” hissed a soldier to his comrade as they squelched miserably along the muddy track. The other man peered into the fog, but all he could see was a heather-covered hillside disappearing into the silent greyness. 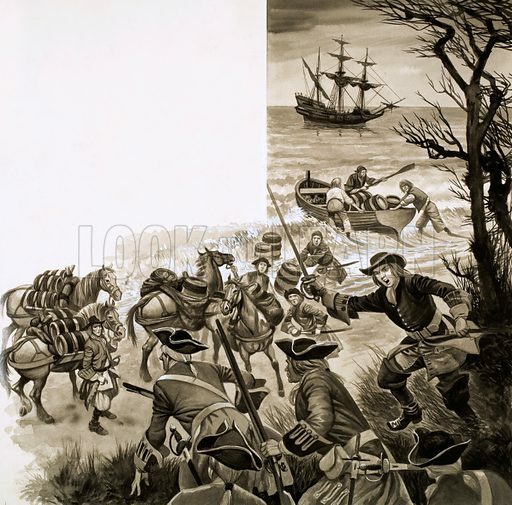 Suddenly, he grabbed his musket tight; he could hear horses galloping – lots of horses. Out of the mist thundered twenty heavily armoured horsemen, sweeping down on the straggling line of infantry and baggage waggons. 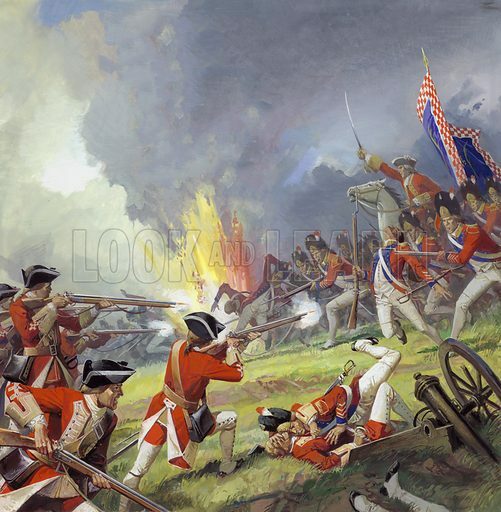 A musket crashed and one rider fell but in an instant the horsemen reached the road; nineteen pistols were raised, nineteen flashpans erupted fire and nineteen barrels belched lead into the confused mass of foot-soldiers. Without pausing, the horsemen turned and galloped away. But it was not over yet. Twenty more riders charged, fired, wheeled and rode away; then another twenty; then the first squadron charged again. As one group advanced another retired while the third reloaded their long pistols ready to charge once more. Soon the track was choked with terror-stricken men (few had any courage left to fight) until at last the horsemen disappeared into the mist from where they came. The scene was Germany during the Thirty Years’ War. 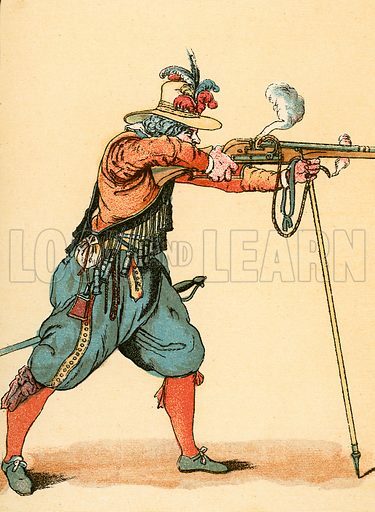 The early 17th century was a bloody era for Europe, but it was also a period of dramatic advances in strategy and the use of firearms. The pistols that those horsemen fired were wheel-locks. They were so devastating and terrifying when used against unorganized infantry, or even cavalry, that such pistol-horsemen, called Reiters, became the “storm-troopers” of their day. This edited article about Madrid first appeared in Look and Learn issue number 535 published on 15 April 1972. The street was narrow, and shadowed, the house distinguished only by its seven chimneys. The man standing in the dark of the doorway, dark hair curling over his shoulders, a cloak across the lower part of his face, held two tired horses. The ambassador closed his eyes. “Bring him in, quickly,” he said. When he opened his eyes again the Duke had vanished. ” ‘Tis madness,” he muttered. And by the standards of the times, of most times, it was indeed madness. It appeared that the prince (later to become King Charles I) had left London with his companion, both heavily disguised and under false names, and ridden across Europe, averaging 60 miles a day, with the lunatic idea of Charles’s wooing the King of Spain’s daughter in person. It was a madcap adventure; an impulse surprisingly approved by King James himself, but highly unorthodox, politically dangerous, not to say extremely risky to the person of the prince himself! Once the secret was out, Prince Charles’s presence caused a great flutter throughout the Spanish court. A second, more formal, entry to the capital was arranged, with many special festivities. 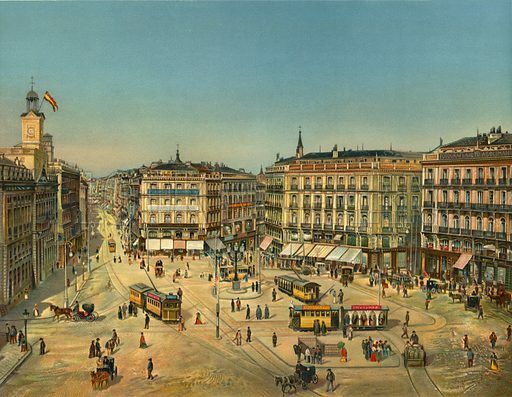 Altogether, Charles spent six months in Madrid. But, alas for romantic intentions. It is only in fairy tales that the prince wins the hand of the beautiful princess in such a manner. There were too many political and, particularly, religious, barriers to the match. The marriage never took place. Oddly enough, Charles later (very happily) married France’s Henrietta Maria, whom he first saw as a girl of 14, in Paris, on his crazy flight through France on the way to Madrid. Princely feet were by no means the first to walk the land now covered by Madrid’s streets and squares. The first to do so were the bare, or roughly sandalled, feet of humble shepherds. The city stands on the main route along which great flocks of sheep have traditionally moved between the pastures of northern Spain in summer, and southern Spain in winter. Longer ago than anyone can remember, the shepherds paused on the banks of the tiny river Manzanares to rest, to water their sheep and themselves to eat and drink. That little river is now bridged, canalized and “tamed” by the people of Madrid, the Madrilenos. But Madrid, as a town, hardly existed 1,000 years ago. Five hundred years later it was little more than a village. As cities go, and compared with London and Paris, it is a mere babe-in-arms.